THE FISHER KING: Jack McBride #2 Cover Reveal! Last week at writers' workshop, I passed out bookmarks for my upcoming historical fiction novel, SAWBONES, and announced that STILLWATER would be on sale for $1.99 this week. Later, a friend asked me what I'm working on. I told her, and she looked puzzled. "Which book are you working on right now? The mystery or the historical fiction." When I signed the deals for the mystery novels and the historical fiction series, I never considered how confusing it would be to talk about five books being published within fifteen months of each other. Hey, I'm not complaining; it's a great "problem" to have! I considered sitting on THE FISHER KING (Jack McBride #2) cover news until after SAWBONES comes out (March 29!) to reduce the possibility of confusion, but I can't wait. It's too exciting and I love the cover too much. How awesome is that? I love, love, love the colors! And the trees and sky reflecting in the water. And how the trees look a little bit like a gash, which represents...well. You'll have to read the book to find that out, as well as the importance of the fire. But, I will tell you this: the evil little cliffhanger I left you on at the end of STILLWATER? That will be resolved one way or another in this book. THE FISHER KING is available for pre-order on Amazon, Barnes & Noble & IndieBound. It will be released in November. If you want to be one of the first to see the cover for the second historical fiction novel, BLOOD OATH, you need to sign up for my newsletter! I've seen the cover draft and it's amazing. I'm so lucky with the artists, editors and publishers I have working on my novels. STILLWATER receives starred review from Library Journal! Seeking to get away from his soon-to-be-ex-wife and his disintegrating career with the FBI, Jack McBride moves to the small east Texas town of Stillwater with his son, Ethan. Unfortunately, on his first day as the new police chief, there is a double homicide at a trailer park; Rosa and Gilberto were hardworking but undocumented laborers who may or may not have uncovered something worth killing for. Then another body is uncovered, buried for more than 50 years under a tree down by the creek. Something is definitely rotten in Stillwater. Library Journal is the trade magazine libraries across the country use to determine what books to include in their collection. A review is good, but a starred review is exceptional and means the chances are good STILLWATER will be included in libraries across the country. If you want to help get STILLWATER in your local library, you can request it through the website. There is usually an easy form to complete to request a book. Include the news about Library Journal's starred review for good measure. SAWBONES review from NYT Bestselling Author Jane Kirkpatrick! When Dr. Catherine Bennett is wrongfully accused of murder, she knows her fate likely lies with a noose unless she can disappear. Fleeing with a bounty on her head, she escapes with her maid to the uncharted territories of Colorado to build a new life with a new name. Although the story of the murderess in New York is common gossip, Catherine's false identity serves her well as she fills in as a temporary army doctor. But in a land unknown, so large and yet so small, a female doctor can only hide for so long. "We'll have finished books on or around 9/15, by the way." I'll be honest, I'm flailing around a little bit here, peeps. My novel, my baby, my debut, STILLWATER, is a real physical thing I will be able hold in my two hands, open and smell the pages, hug, put under my pillow at night, and carry around, cover out, everywhere I go so people will ask me, "What's that you have there?" My book is in the warehouse, which means there's a very good chance retailers will start shipping out pre-orders next week. Before pub date! To thank those who have pre-ordered STILLWATER, and to encourage those who haven't had a chance yet, I'm running a promotion from today through the first week of publication. Email me your order receipt and I will email you the link and password to a webpage that contains an annotated deleted scene of Miner giving Jack a tour of Stillwater. Annotated deleted scene? Translation, please? It's sort of like pop-up video for a movie blooper reel. Bits of the manuscript that didn't make it into the final version with footnotes about writing, characters and the town. Sold! What do I do? 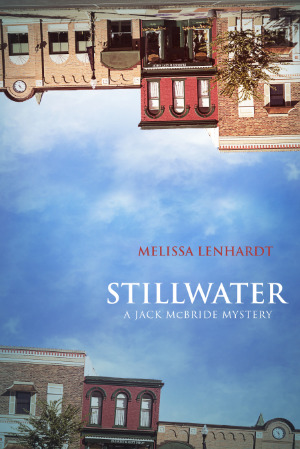 Pre-order STILLWATER and forward the receipt to info (at) melissalenhardt (dot) com with PROMO in the subject line. I'll reply with the link and password. Read and enjoy! Don't worry if you plan on purchasing a copy of STILLWATER at my launch on Octobere 3. I'll make sure you get the link and password that night! Thanks for going on this journey with me! We are almost there!